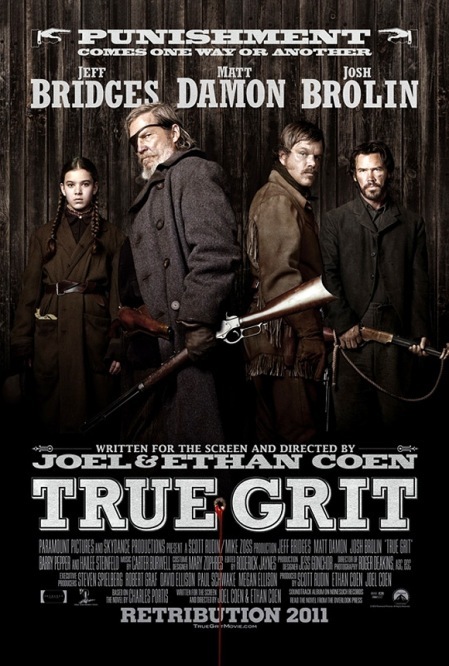 True Grit is legit. A deep character-driven western with plenty of suspense despite at times displaying a slightly slack pace, it will be thoroughly enjoyed by fans of true westerns. As a remake of the 1969 original, the Coen brothers made some extremely wise casting decisions which was crucial for this modern version so it didn’t pale in comparison to the John Wayne-led original. The film displays the most authentic dialogue, scenes, and storyline in any recent film, let alone those it will be directly compared to in the western genre. While Jeff Bridges may catch all the accolades for his role, which would be well-deserved, he and the rest of the cast were regularly outshone by a 13-year old girl. It was Hailee Steinfeld in her breakout role as Mattie Ross, a wise-beyond-her-years girl out for vengeance of her slain father, who should be in line for an Oscar nomination. Don’t get me wrong, Bridges puts in his usual stellar performance, but his role runs a similar parallel to his award-winning performance as down on his luck country singer Bad Blake in 2009’s Crazy Heart. As a rough and tumble lawman with a penchant for hitting the sauce, he effectively displays a hard exterior with a soft inside. He’s a man you wouldn’t want to meet in a gunfight, yet still felt safe with. Matt Damon puts in a surprisingly solid performance as a Texas Ranger looking to settle the score for his own reasons. Maybe it was just me, but I really wasn’t buying him as an authentic western character coming into this film. While he did exceed my expectations, you still can’t shake thinking that it’s still Matt Damon playing an old west character. Bridges makes us forget about his other roles and allows us to get lost in his performance which is a level above what Damon pulled off this time. Josh Brolin makes a minimal yet effective appearance in what I consider a more difficult task for him. When he is a lead, you tend to get drawn in and feel absorbed in his depth, but in this instance we have to see him in a limited capacity. While some may say the story was somewhat predictable or that the pace was slow at times, I think there were more than enough surprises to counter those arguments. The most pleasant surprise I found was that this movie bordered on being hilarious at times. For what put forth the aura of a serious and suspenseful western, there were times when I was cracking up. Since the dialogue moves very quickly it can be hard to keep up with but if you can manage to stay with it you will find there are plenty of witty golden nuggets. The other, more shocking, revelation was that for a Coen brothers film this one ties up quite nicely in the end. No fade-to-black in mid-conversation, or hanging chad to leave you and your imagination flapping in the wind. Nope…just a nice ending with one or two small loose ends but for the most part a true closing to a well-told story. Take it all in, enjoy it, and you will feel rewarded at the end. Interesting Cameo Appearance: A nice camouflaged role by Barry Pepper (the oft-overlooked but not underappreciated star best known for his roles in Saving Private Ryan, The Green Mile, and my personal favorite as Yankee legend Roger Maris in 61*) as Lucky Ned Pepper, a roughneck leader of an outlaw gang being chased by Bridges and Damn’s characters. Rooster Cogburn: Why, by God, girl, that’s a Colt’s Dragoon! You’re no bigger than a corn nubbin, what’re you doing with all this pistol? Rooster Cogburn: Well, this’ll sure get the job done if you can find a fence post to rest it on while you take aim. Mattie Ross: I hope you don’t think I’m going to keep you in whiskey? Rooster Cogburn: I don’t buy that, I confiscate it. And a touch of it wouldn’t do you any harm against the night air! Mattie Ross: I would not put a thief in my mouth to steal my brains! Rooster Cogburn: Well, it’s the real article! Genuine, double-rectified bust head. Aged in the keg. LaBoeuf: What are you doing? Rooster Cogburn: Lookin’ for sign. LaBoeuf: You couldn’t see it if you saw it. Rooster Cogburn: We’ll sleep here and follow in the morning. Mattie Ross: But we promised to bury the poor soul inside!